Since moving to Florida, I have been shooting as a contractor for George Street Photography. I still occasionally shoot under my own studio as well, but working for George Street has been perfect for me. All I have to do is the fun part – the photography – and they take care of the rest! This has allowed me to indulge my passion for wedding photography while devoting most of my time to my PhD studies. Seriously, weddings are an addiction: I go through withdrawals if I can’t shoot a few every season (which makes me a pretty odd duck in the world of geology academia). The hardest part about shooting for GS is that I have to wait several months before I post photos on my own blog, and the wait is so hard! They have connected me to the best couples in some amazing venues. 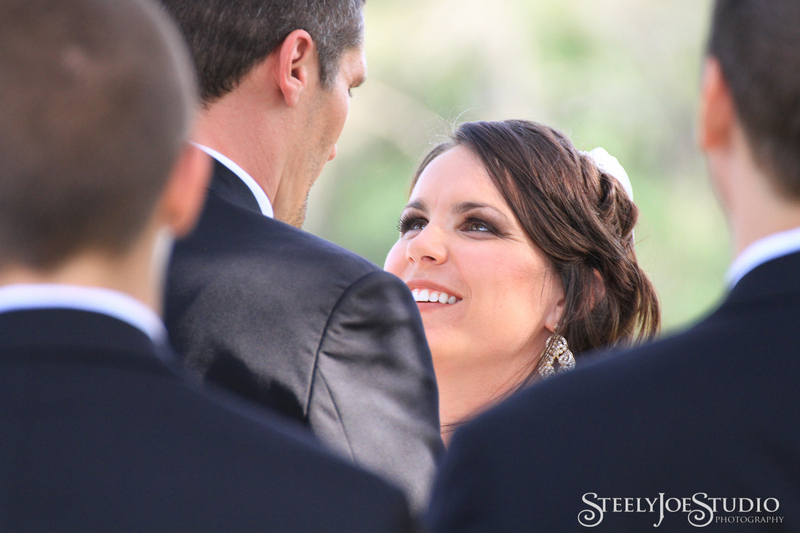 Anyway, Enjoy the photos from this beautiful outdoor spring wedding in Punta Gorda. 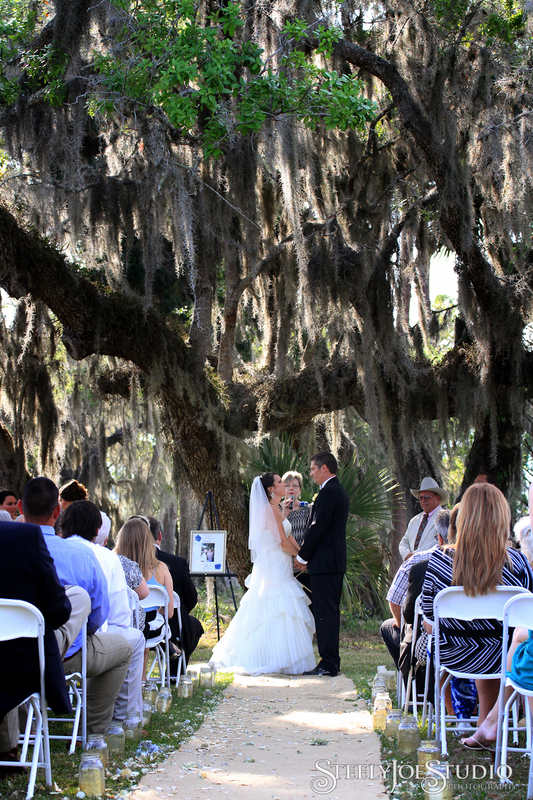 Spring is a great time to have an outdoor wedding in Florida – the temps are nice and everything is so green. 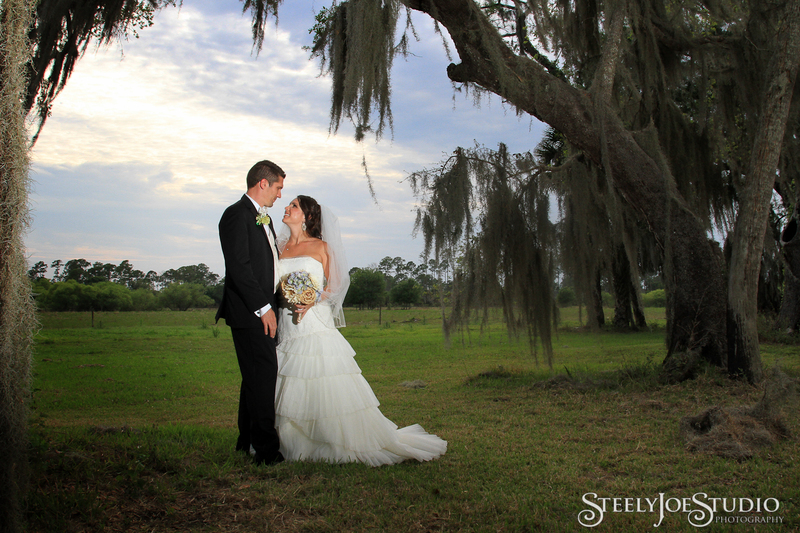 Mallory and Jeremy planned a country wedding at a unique venue in west-central Florida called Hall Ranch. 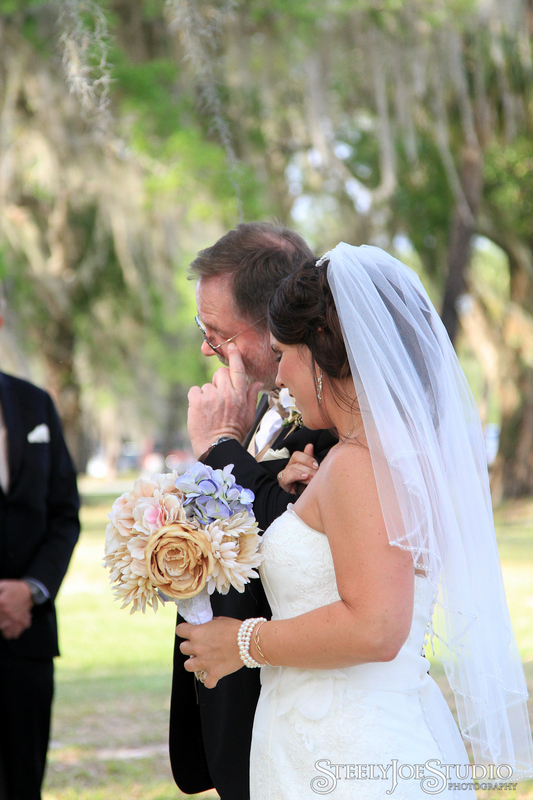 This wedding was uniquely Floridian, with preparation and pre-ceremony portraits right on the Gulf at PG Waterfront Hotel, and a rustic ceremony and reception beneath the live oaks and palmettos in the country. 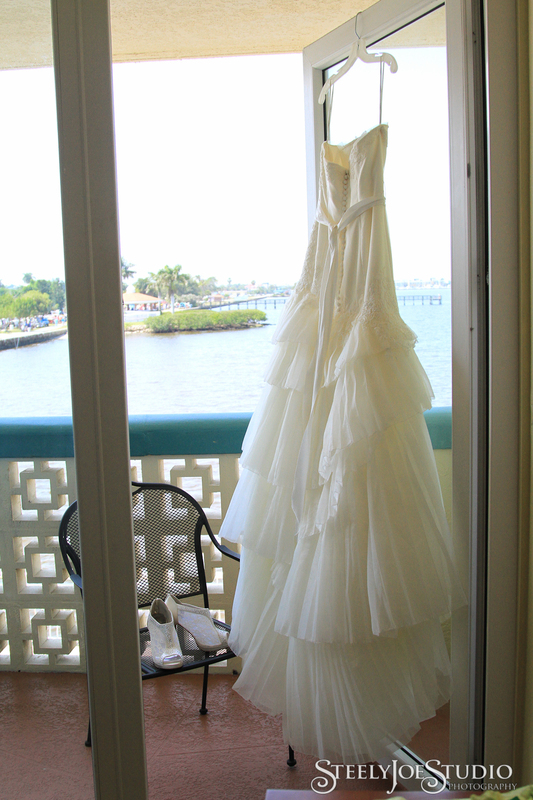 It was a beautiful day with handmade details in a beautiful setting. The bride and groom had prep rooms right next door to each other, which allowed us to get some cute pictures of the two of them before the ceremony without doing a “first look”. 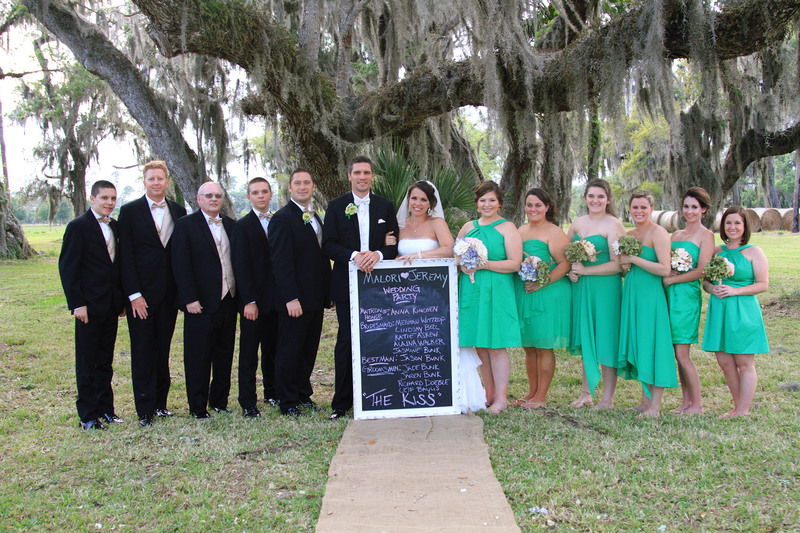 When all the preparations were complete, the bridal party loaded up in a limo for the drive to Hall Ranch for a beautiful ceremony under a gigantic Live Oak tree. 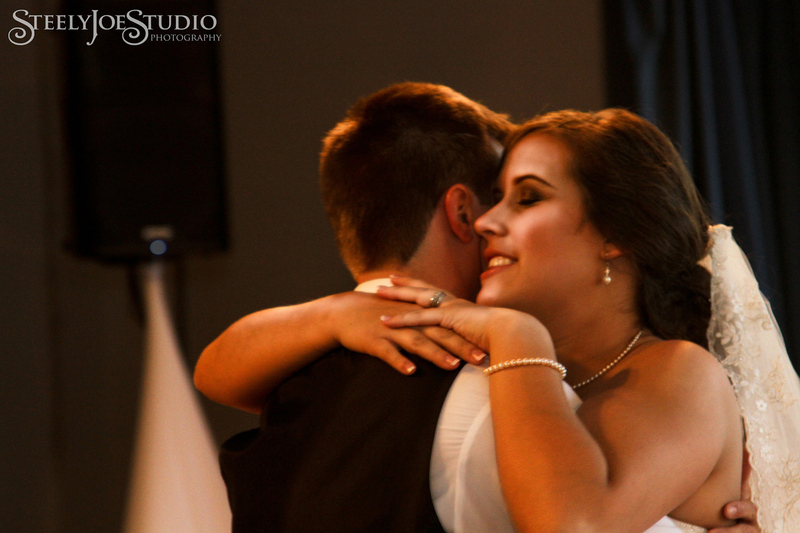 The Bride and Groom warmed up for the reception by dancing down the aisle after they tied the knot! 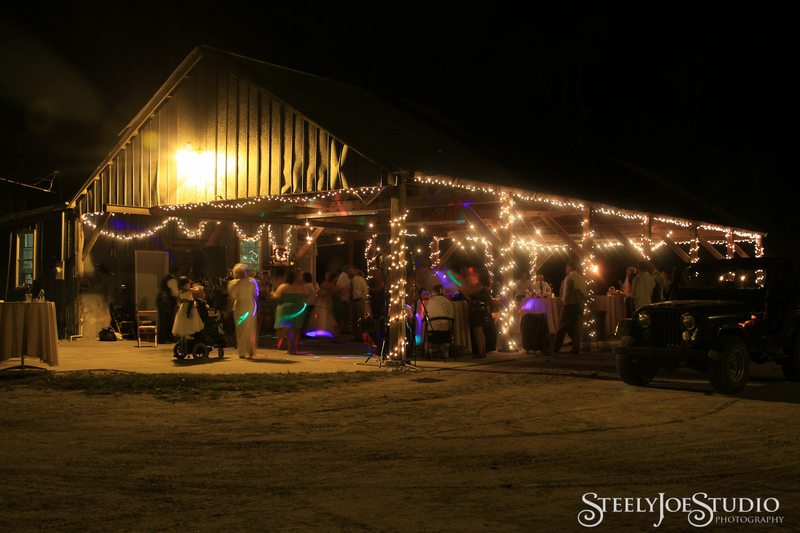 The reception was in an open-sided pavilion on the ranch. 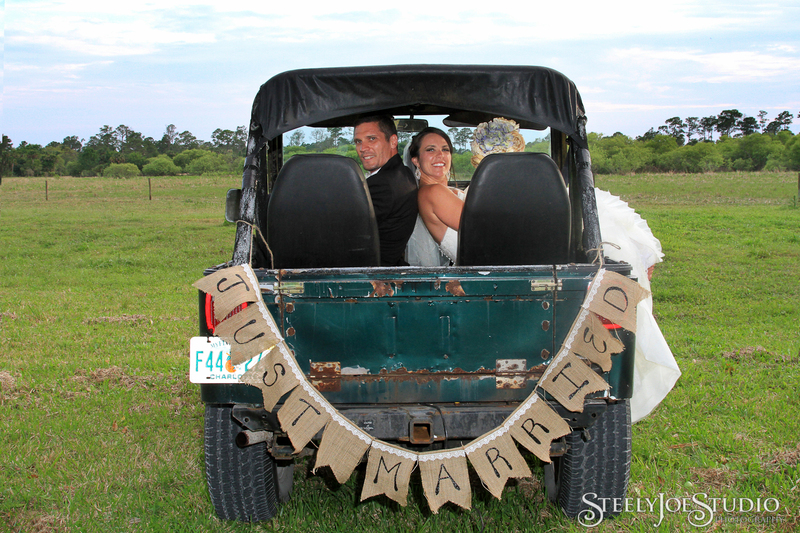 The D.I.Y details were the perfect addition to the rustic setting. The bbq was amazing, the guests were tons of fun, and the party went well into the night! 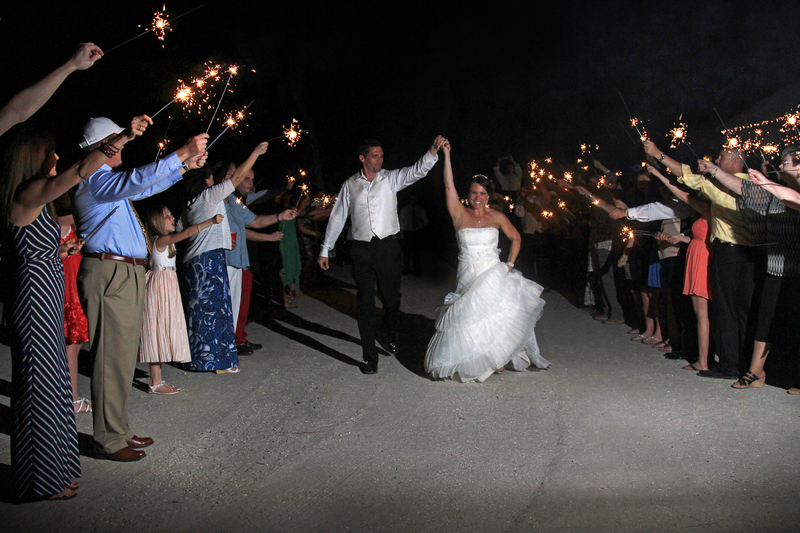 After the sparkler send-off, a bus was waiting to take guests back to the hotel; a very thoughtful detail that allowed guests to fully enjoy the party! 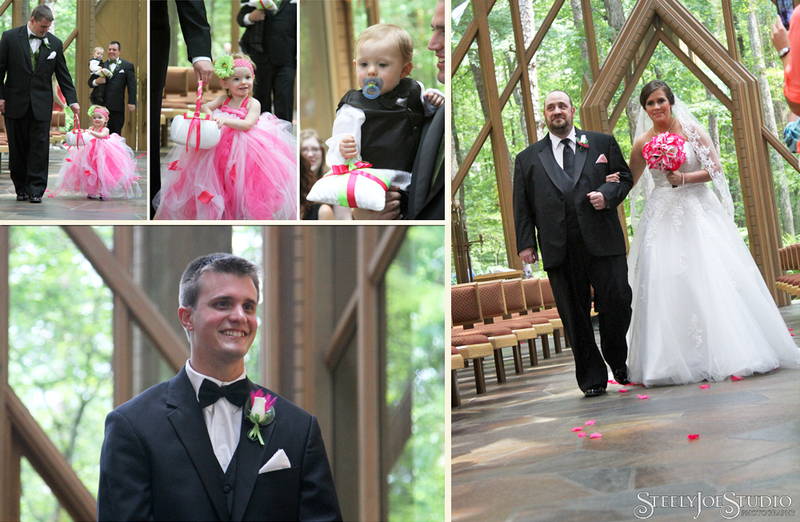 It was a celebration focused on friends and family, perfect for this sweet, laid back couple. 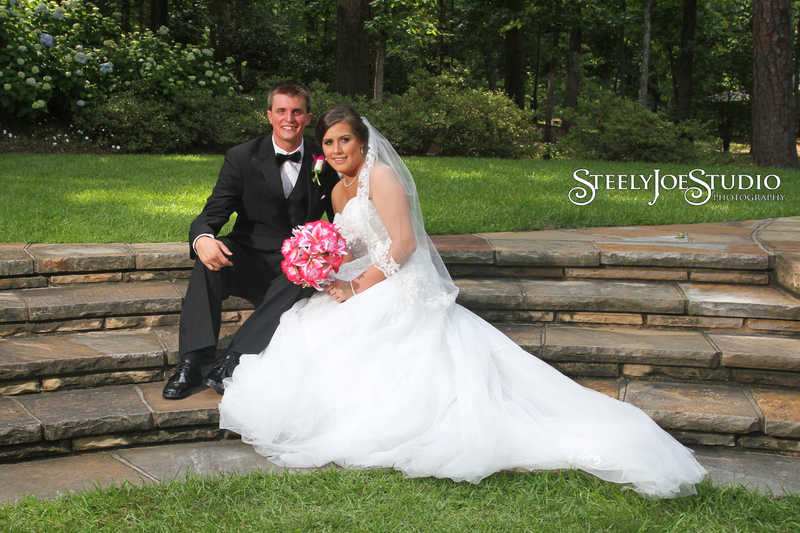 Congratulations, Mallory and Jeremy! 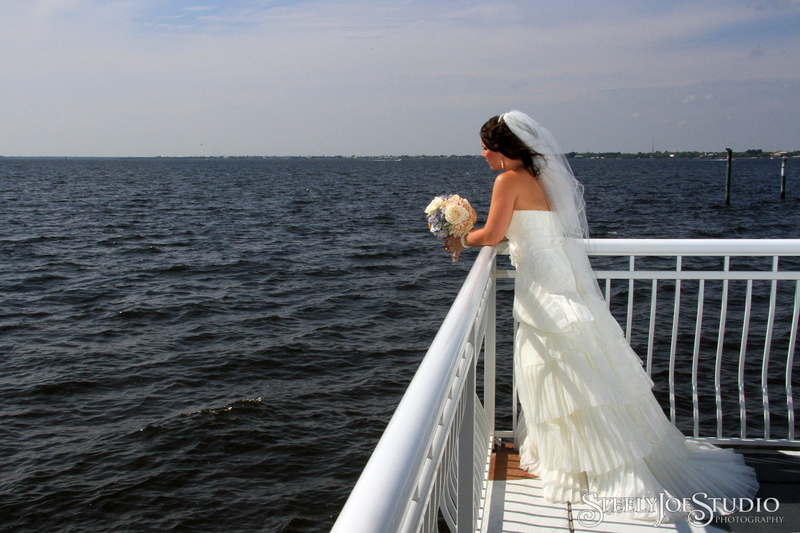 Categories: destination wedding, wedding photography | Tags: country wedding, Florida, PG Waterfront, Punta Gorda Florida, ranch, spring | Permalink. 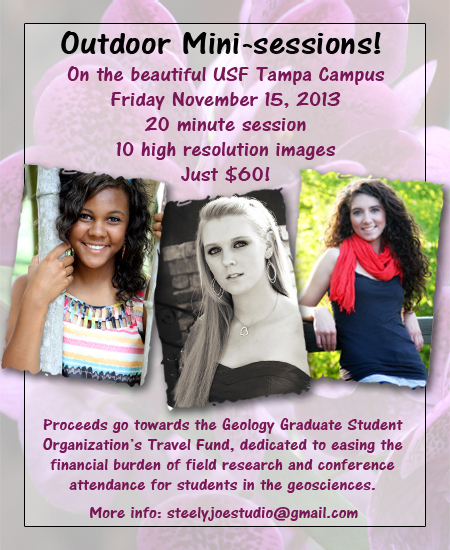 Professional Headshots and Fall Mini-Sessions at USF! I am so excited to be partnering with the Geology Graduate Student Organization to offer TWO great events. 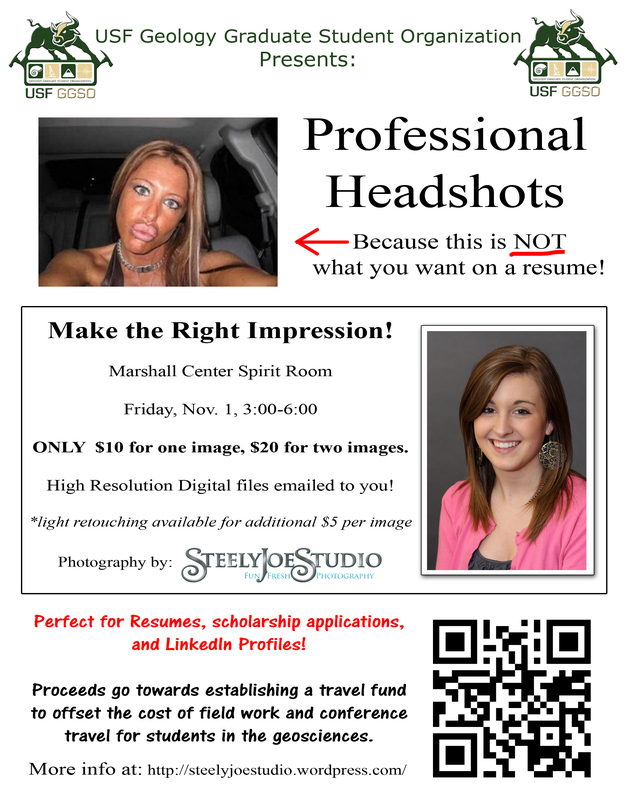 On November 1st, we will be in the Marshall Center offering Professional Headshots for just $10 per image! For those looking for something gift-worthy, we are also booking outdoor mini-sessions on the beautiful University of South Florida campus on Friday November 15th. 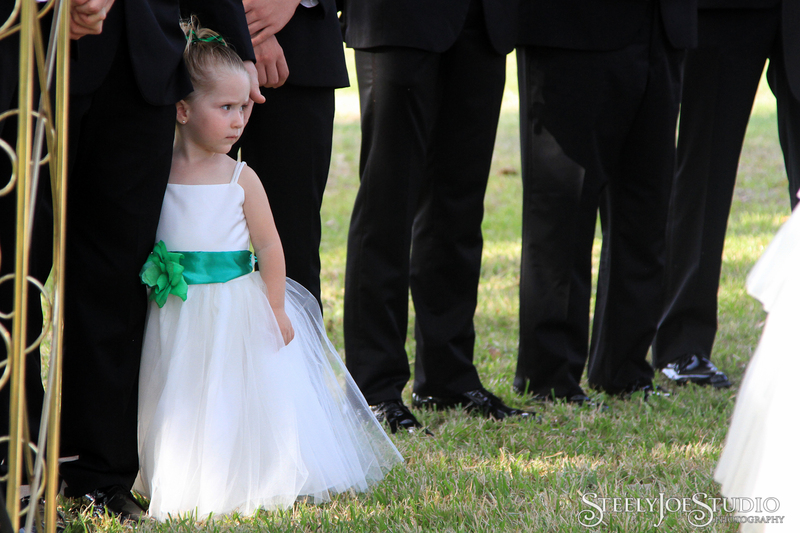 The mini-sessions include a 20 minute session, and 10 high-res digital images with full printing rights for ONLY $60! This is a great offer and a fraction of what an outdoor session would typically cost. 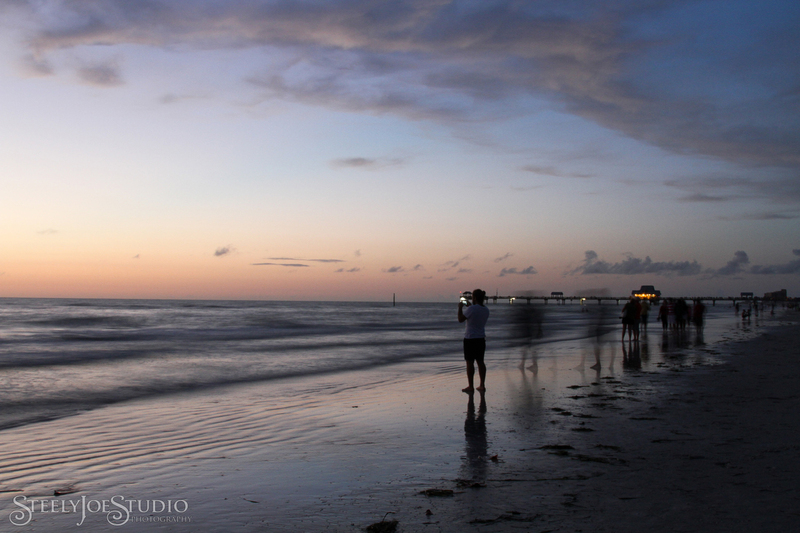 Images will be delivered in time for the holidays – what a great gift idea! Proceeds will go towards establishing a travel fund to help offset the cost of field research and conferences for graduate students in the Geosciences department. Many times the cost of traveling to do geologic research or present findings at a conference are primarily absorbed by the student. This can create a significant financial barrier to a young scientist’s career. So come on out to support a good cause and get some great photography! If you are an individual, couple, family or group who would like some great images while supporting a good cause, this event is for you. No reservations required for the Professional Headshot event – just drop by “dressed for success”. Due to the limited number of spaces available for the mini-sessions,, a 50% non-refundable deposit is required to secure your spot. Contact me to book or if you have questions, but hurry – these sessions will fill up fast! Learn more about GGSO at: http://shell.cas.usf.edu/geograd/, or follow them on Twitter @USF_GeoGrads. I have been admiring the cool images created by other photographers by burning steel wool – just a quick Google search of “steel wool photography” gives you some amazing results! I studied up and decided that I would celebrate Labor Day by treating myself to an awesome session of throwing fire around. It’s easy enough to find directions on how to create the sparks, Photojojo has a nice simple tutorial. But since you can do this with a nice long shutter speed, why not add in some traditional light-painting as well? Finding people to help with this when you are friends with a bunch of volcanologists turned out to be really easy (surprising, I know). The most difficult part of this project was finding a place where we could do it. People tend to freak out and call the cops if you try this kind of thing in a public area. It took a bit of scouting, but we found a great location with a big stretch of wet sand well away from anything that might catch on fire. 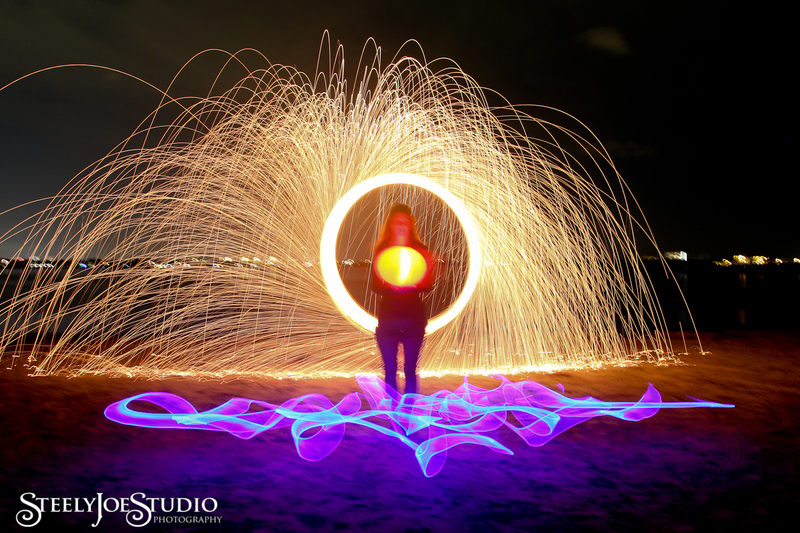 Three light sources in this image are the spinning steel wool, a headlamp held in the models hand, and red and blue light wands held together to paint the swirls. Awesome! It looks like some kind of magic yoga. 3 light sources give this picture its unique look: the spinning steel wool, a Chinese lantern and a blue light wand for “painting” the ground. Amazing image right out of the camera! 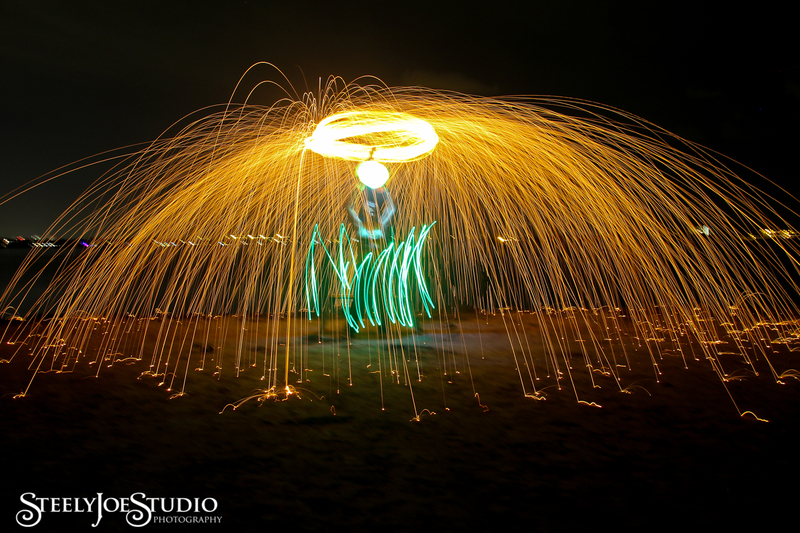 Another 3-source image: the spinning steel wool fire, a Chinese lantern, and a green headlamp light. The model has to hold very still for this kind of result, which can be a challenge when sparks are flying around you. But look at the epic results! Want to see more? 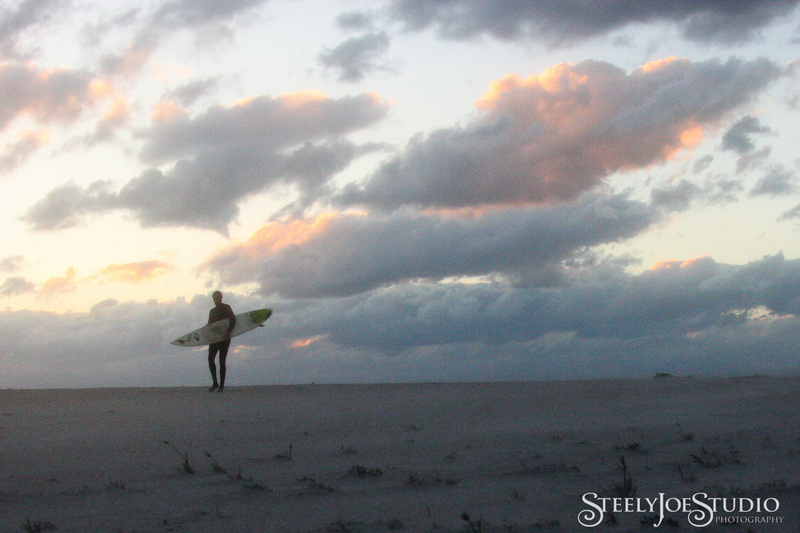 I posted some more from this session on my Facebook page: Steely Joe Studio on Facebook. I am sure this will not be my last attempt at this style of photography. I see this more as a warm-up run for even more amazing creations in the future! 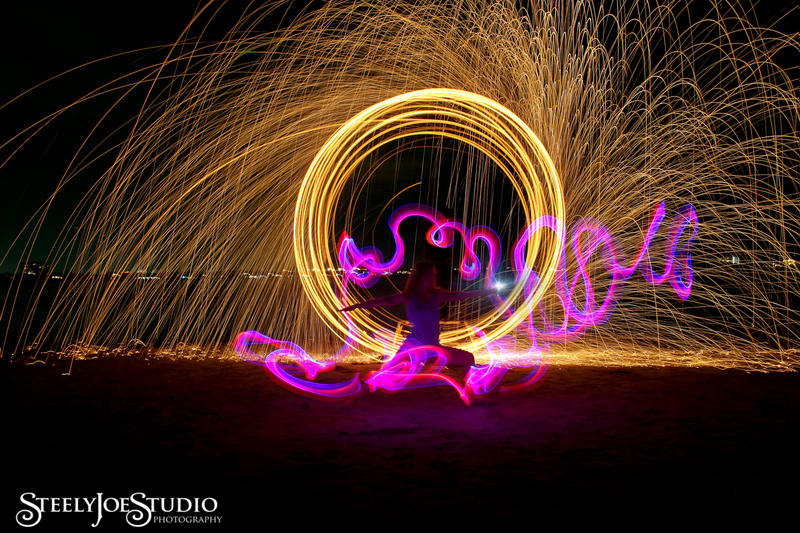 Categories: light painting, Uncategorized | Tags: light painting, long exposure, night photography, steel wool, Tampa Bay Wedding photographers, tampa senior portrait photographers, yoga | Permalink. 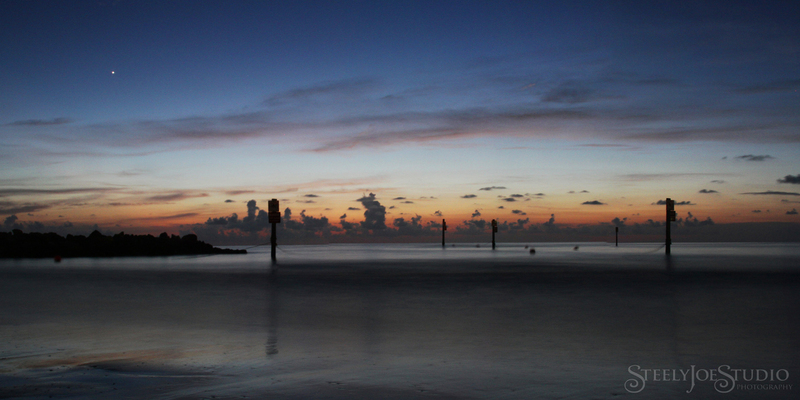 A long exposure from the southern end of Clearwater Beach looking west shows Venus setting over the last bits of a beautiful sunset. The rock pile at the southern end of Clearwater Beach. I really like what the silhouetted man brings to this image. In a long exposure image, objects standing still will be sharp, moving objects are blurred. I like how the one guy taking a video with his cell phone is sharp and all the others are blurred. Hope everyone out there has a great week! Categories: landscapes, Uncategorized | Permalink. 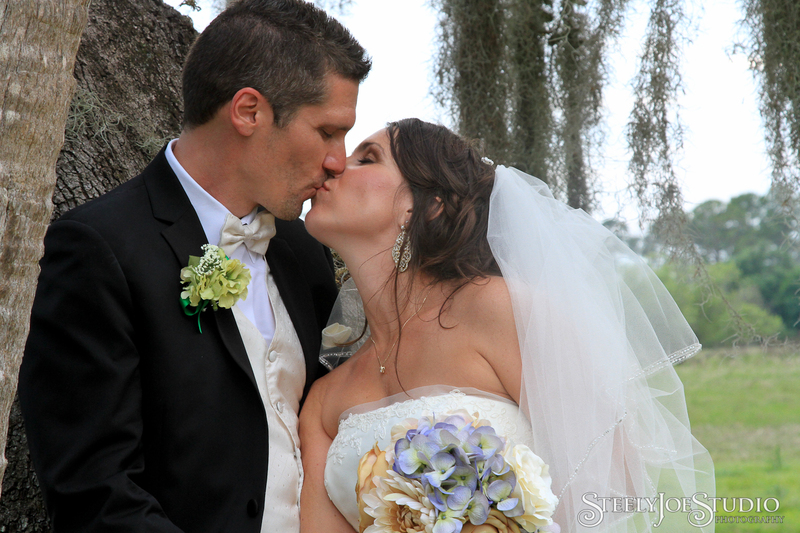 Jessica and James were married in March at Seminole Heights Garden Center in Tampa, Florida. 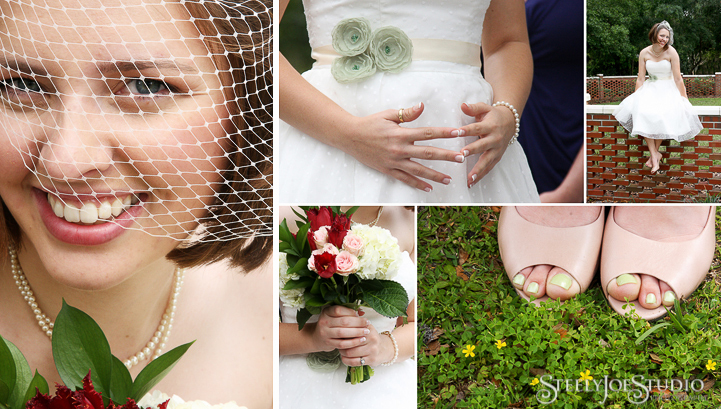 It was a very overcast spring day, but the rain held off just long enough for a beautiful outdoor ceremony. The Garden Center is a pretty little property in the historic Seminole Heights neighborhood. 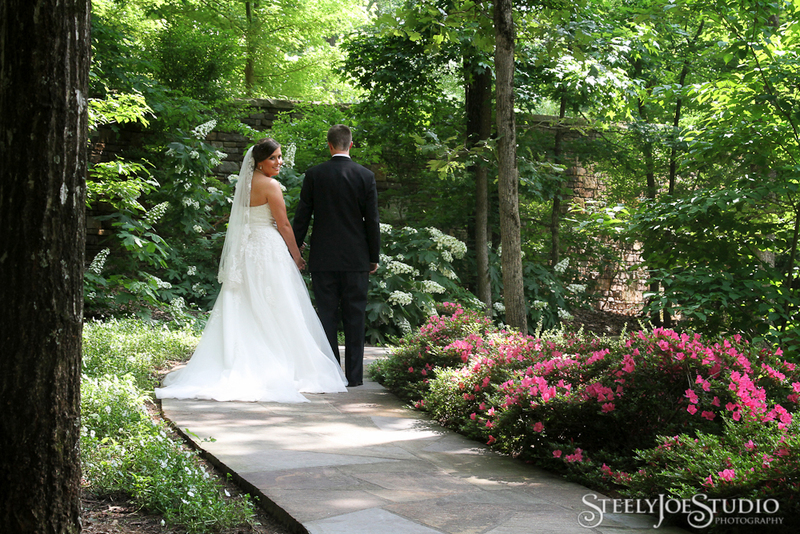 The style of this wedding was vintage with a “rockhounding” touch – not something you see at every wedding! 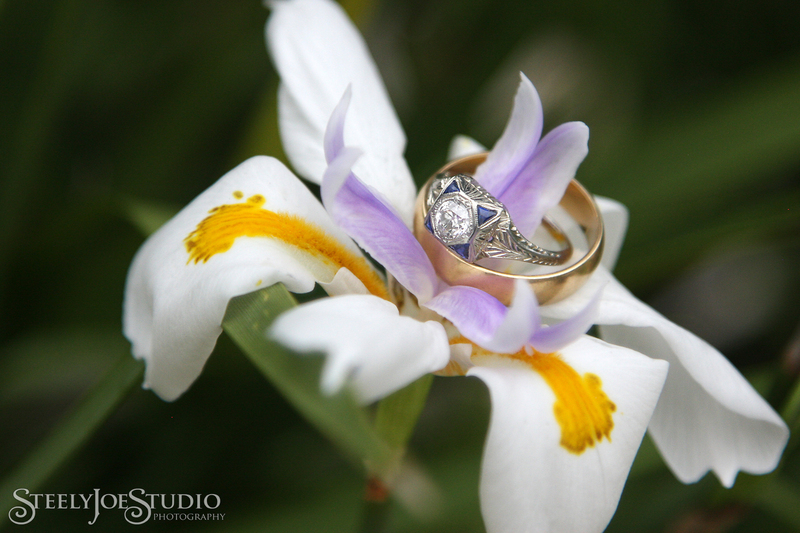 One of my favorite ring pictures ever! 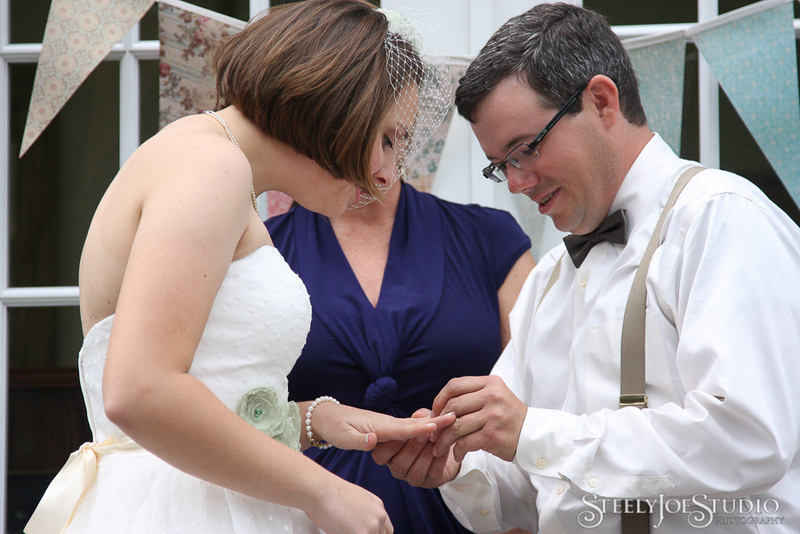 The absolutely beautiful vintage ring set was chosen by the groom. He did good! The brides vintage style was created with a combination of antique pieces and handmade accessories. 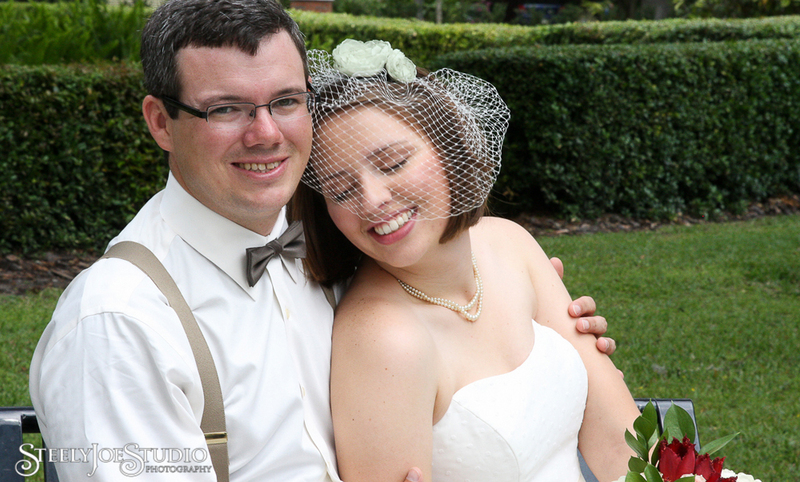 The birdcage veil and matching belt were both made by the bride! 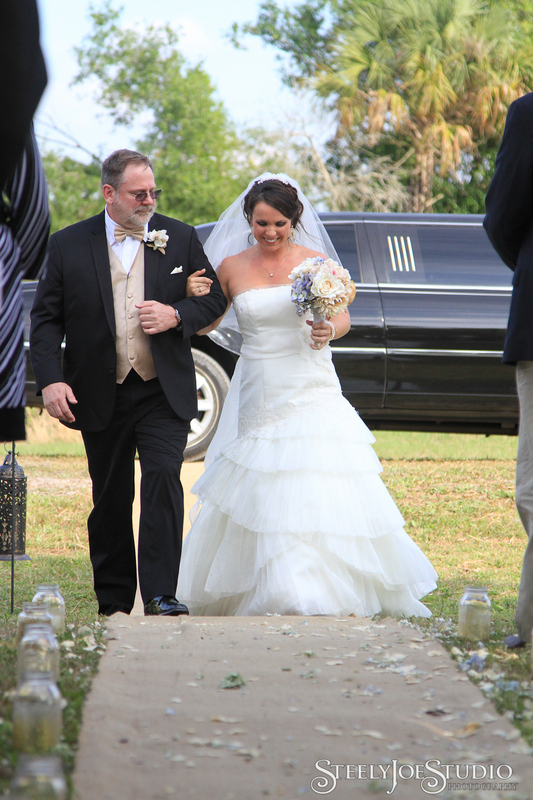 The couple describes their wedding theme as “Sunday dinner at grandma’s house”. 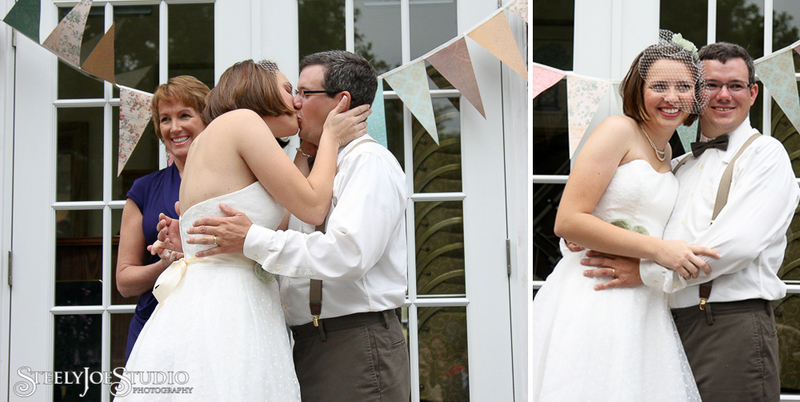 This required many vintage and handmade touches pulled together by creative family and friends. BBQ was served on tableware pieces collected from flea markets and antique malls. Dessert was served out of dishes borrowed from family members, some of which were heirlooms giving the feel of family tradition to the event. 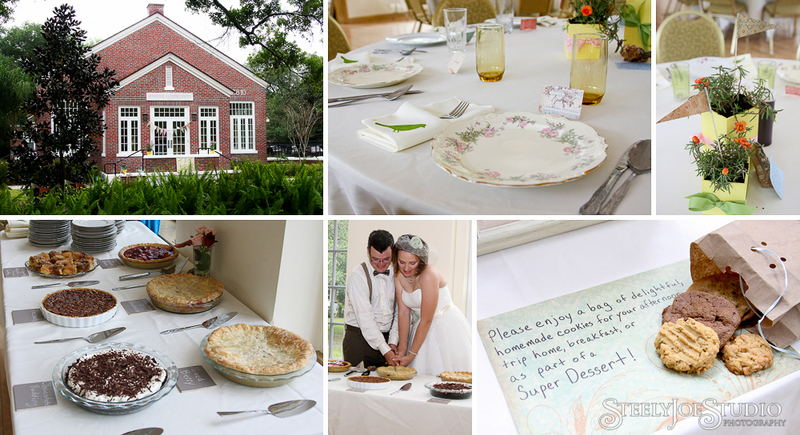 The vintage theme included a variety of antique dishes and tableware, a wedding pie dessert bar, and homemade cookies as favors. Its not often you see a geology theme added to a wedding, but this event did it very well. When the bride and groom are both geologists, why not incorporate it into your theme? 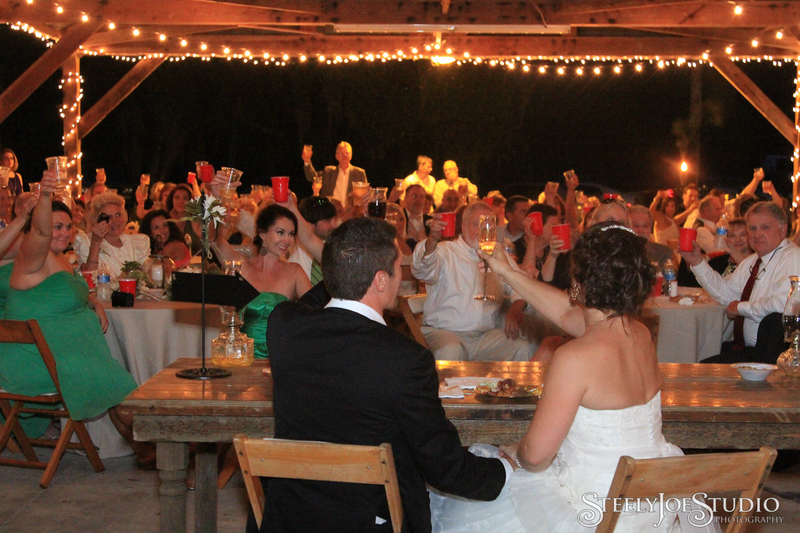 Each table had live plants in wooden boxes along with a rock and the story behind it. Many geologists have rock samples they feel very sentimental about, and this was a great way to incorporate it into the wedding. Some of the guests even got into the theme by wrapping gifts in old geologic maps and posters. There was even a fake rock in the playground in the garden that of course we had to use for some pictures. 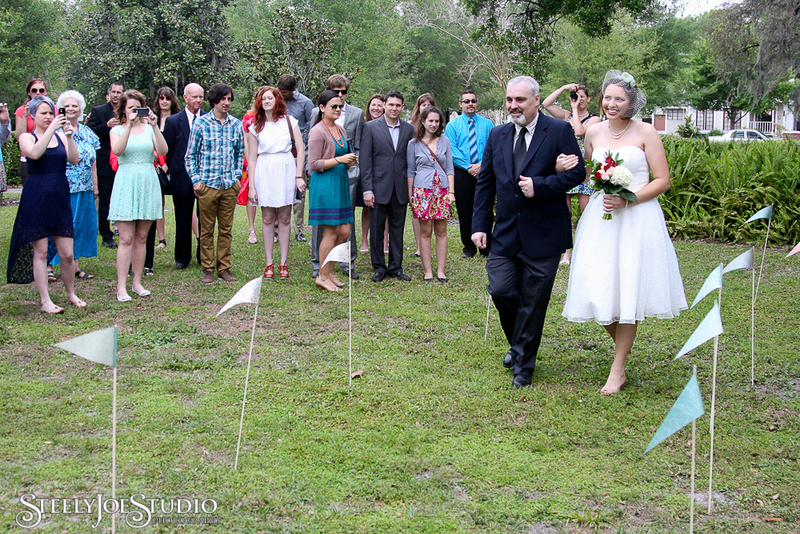 Colorful paper flags marked out the aisle for the outdoor ceremony. 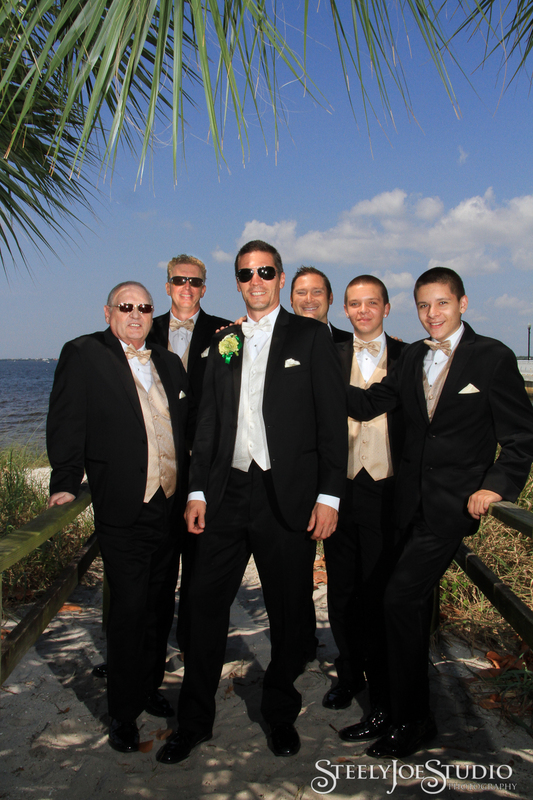 Categories: bridal, engagement, wedding photography | Tags: birdcage veil, geology, outdoor ceremony, retro, Seminole Heights Garden Center, spring, Tampa, tea length wedding dress, vintage wedding, wedding photographers | Permalink. 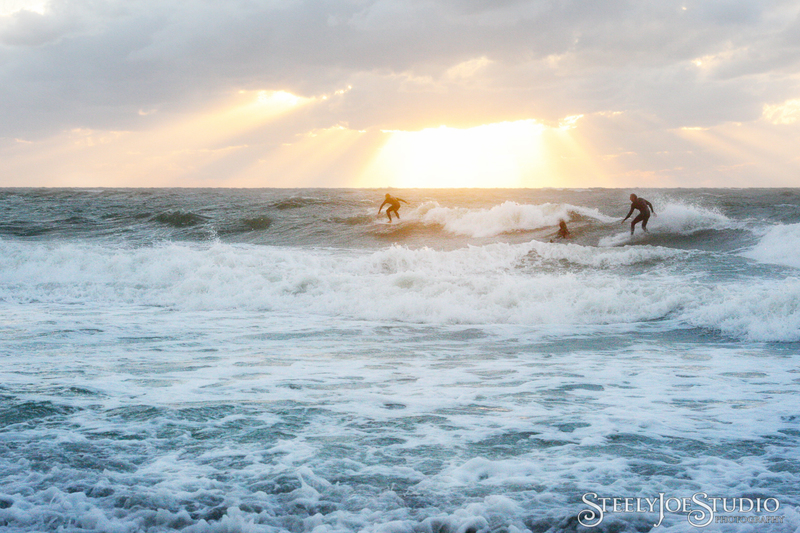 We went out to shoot the sunset and found surfers enjoying the waves. 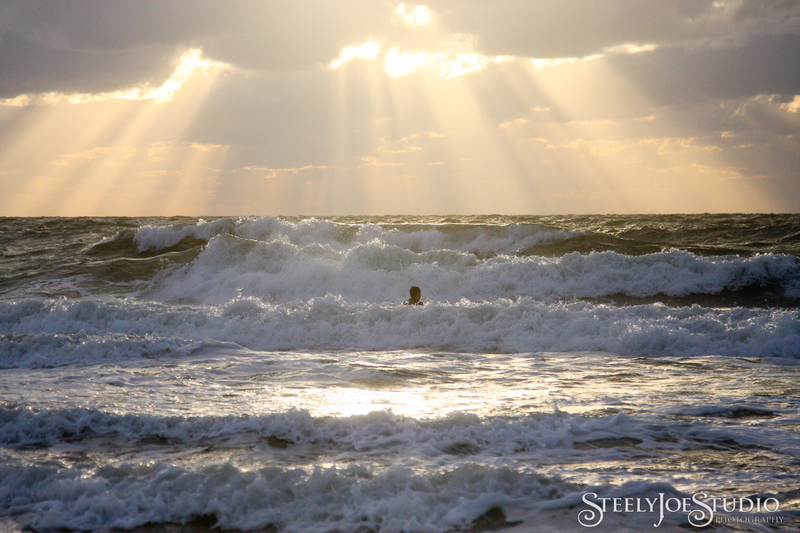 It’s not everyday you get waves big enough to surf in Clearwater, so even if its chilly and very windy, it won’t keep them away! These were taken out at Sand Key Park, and we had a truly spectacular sunset! The surfers added a really nice element to these landscape shots. 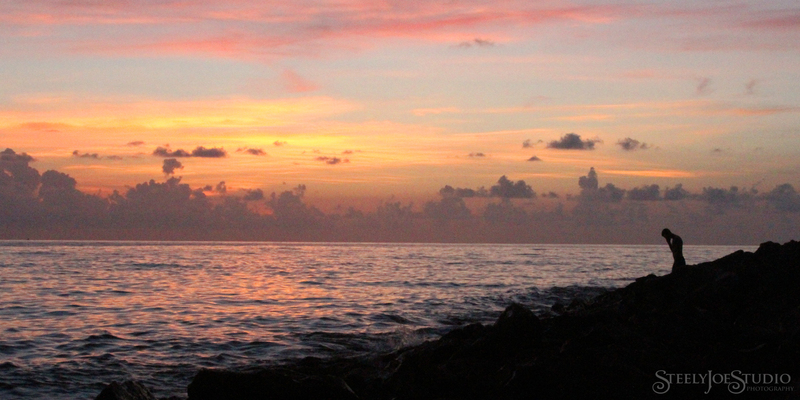 Really love the tiny people in the vastness of the sunset and surf. 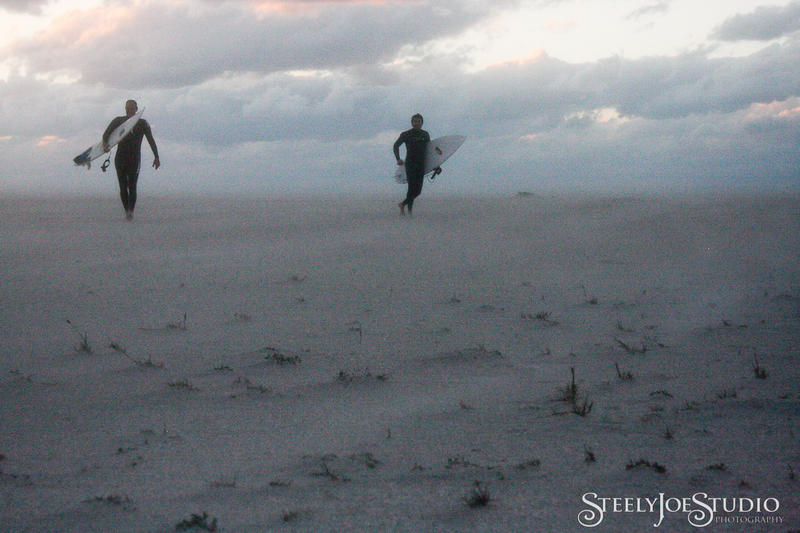 Surfers in the sandstorm. About dusk, a really ferocious sand storm started up. Good thing I had a filter on my lens so I could shoot into the blowing sand! 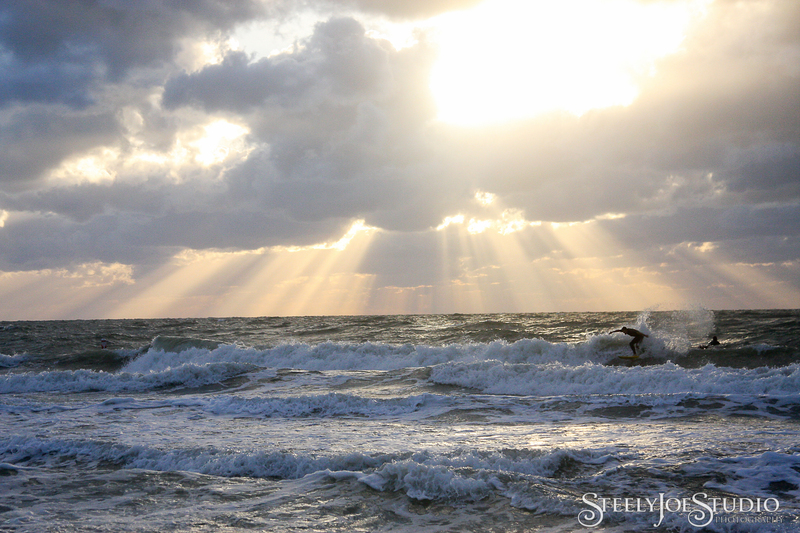 At one point I wondered if the surfers realized what an amazing show they were missing in the sky behind them. But I got my answer. 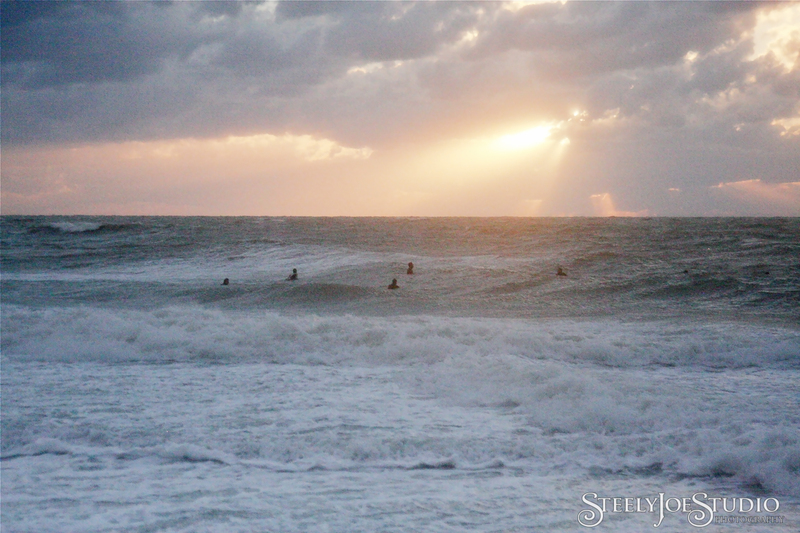 At the best part of the sunset, when a huge orange beam poured through the clouds, all the surfers on the beach, without speaking to each other, turned to face the sun. It was a strange and beautiful thing to watch.